As a rule anthology films don't work. More often than not its an up and down affair with some good and some bad segments that result in the feeling you are less than satisfied. 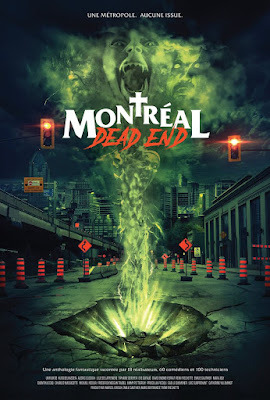 Thankfully MONTREAL DEAD END is one of the best anthology films you will see and while the film has good and bad moments it all ties together to make a complete film. The premise of the film is an old curse comes to pass and the gate to hell is opened if it isn't closed in 24 hours the world will end. As people race to close the gate mischief happens as people are turned into zombie of ax wielding maniacs, bodies are switched and nature runs amok. That the film works as well as it does is due to two thing, first it has a wicked sense of humor. Playing things for laughs as much as scares the film doesn't take itself seriously with the result that it allows itself to wander all over the city with all sorts of crazy ideas which actually work. The other thing that makes the film work is that the film ties it all together. Despite being little scary stories about the weird things happening around the city everything is tied together. Bits build on each other, if not in the foreground but the background so it isn't one and done, on to the next it's a building stream that takes us to a conclusion. It something most other anthologies don't do and we are worse for it. 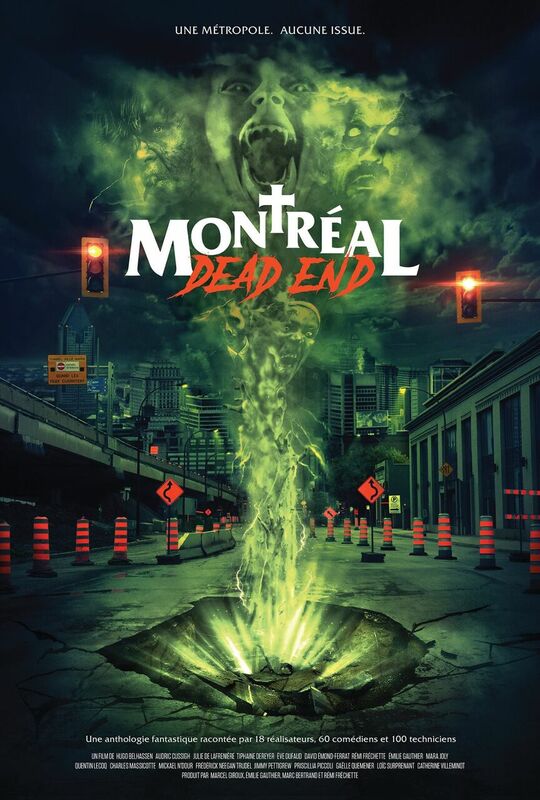 I loved MONTREAL DEAD END. I was sitting in a restaurant with a friend talking about covering the Blood in the Snow Film Fest and I said I had pretty much watched everything they had screeners for except MONTREAL and I was burnt out. I wanted to skip the film. He was shocked and said- "No you have to see it. Its one of the best anthologies you'll see. Actually its one of the most fun horor films you'll see all year." He was right. MONTREAL DEAD END is a blast. Its a joy to watch and one of the top films at Blood in the Snow Film Fest.